Frickley Athletic are back on their travels this Saturday as they look to continue their steady progress under manager Martin McIntosh. Although they have been held to a draw in their last three home games the Blues have won two of their three away games under McIntosh, including beating top of the table Morpeth Town and keeping a rare clean sheet at Marske United, so they can travel with confidence to take on opponents in ninth. 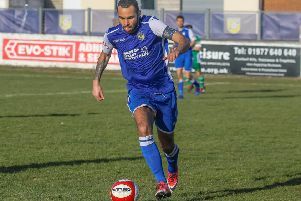 Frickley remain in 13th place after their draw with Pickering Town and they have now won three, drawn three and lost just one Evo-Stik East League game since McIntosh took over. With five wins on away soil so far they have won more than at home this season while Belper are also more successful on their travels, having achieved six away victories to only three at home. The Blues will be looking for revenge, having lost 2-0 to Belper in the sides’ first meeting this term, in November. A supporters coach is being planned for Saturday’s game. It will be £10 a person and will depart North Elmsall at 1pm, returning immediately after the game around 5pm. Anyone wishing to travel can contact John Longbottom on 01977 647242. Danny Rowe will not be in the Frickley side as the defender or midfielder has left the club to join Whitby Town. Frickley, meanwhile, have been drawn at home to Staveley MW in the semi-finals of the Sheffield & Hallamshire Senior Cup. The tie will take place at Westfield Lane on a date and time to be confirmed and will see the Blues looking to reach the final for the seventh time in eight years. Maltby Main will host North Gawber Colliery in the other semi-final. Frickley are having a working day at their Westfield Lane ground on Sunday (from 8.30am) with main tasks putting up more fencing and general maintenance.